While using the HTC Vive, I enjoyed it most when I pulled back a bow and felt the vibration and sound telling me that I had put in effort to pull back the bow. After shooting many arrows, my arm had actually started to feel tired (but not nearly as tired as I would be from shooting that many arrows in real life). To enhance it more, I would want to be able to lean over the parapet just enough to see down- the limited area of motion became annoying over time. However, for my first time playing, it was probably a good limitation that kept me from feeling sick. The part I liked least was trying to figure out when to point and click, and when I should grab with the trigger. It wasn’t clear when each needed to be done. This will likely be solved as more VR games are created. They will need to come up with a common design language that will become as natural as moving a mouse on a computer. 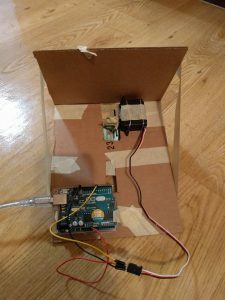 The servo motor is placed on top of a cardboard sled that has two legs in front to keep the front up. 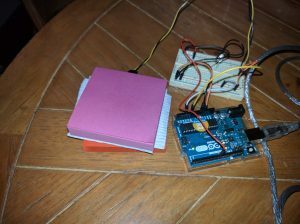 The servo motor base it tied with twine and taped to the cardboard. The servo motor head is taped to legos. The legos have a rubber band through them that makes the hinge try to extend like a prosthetic leg. When it pushes down, the movement pushes the sled forward. On the return trip, the knee flexes as it is pulled the other direction. 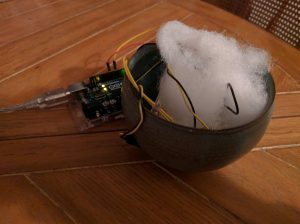 The Arduino is also on the sled. 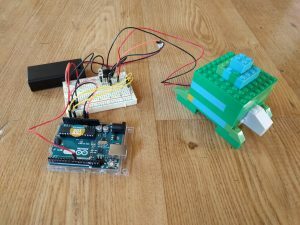 This Lego turtle gets angry and vibrates whenever there is light on the light sensor. There is a DC motor inside the turtle. The motor has a piece of cork on it, so running the motor makes it vibrate. If the light sensor reading is over 500 (about 50%), then the turtle will pulse vibration for 0.2 seconds, then pause for 0.5 seconds. This makes it sound angry without being overwhelming. The speed of the motor is directly related to the light reading. The thoughtless act I have been watching is chest of drawers that is regularly used as a trash can. 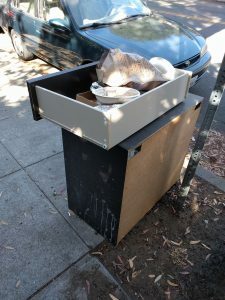 Because the drawers have been placed on a sidewalk, they appear to be trash, but they have not moved for at least a few days (if not longer). One drawer was placed on top and is shaped correctly to hold things, and has been used to hold trash. On the surface, this appears to have a very simple solution: put a trash can there. However, walking by the drawers for a few days in a row, I have seen the trash change. Someone has taken the time to empty the trash on top. It is still unclear why the entire set has not been taken to a dump. This bowl acts as a night-light and glows red when picked up while it is dark. Upon being set down, it plays “Twinkle, Twinkle Little Star” and the light slowly fades. During the day when there is light, it appears to be just a bowl of cotton balls. In this way, it acts as an object that will put the user to sleep at the end of their day. I used a force-sensitive resistor on the bottom of the bowl to measure when it is set down, and I used a light sensor on the bowl to measure whether it is dark around the bowl. A piezo speaker plays music. The Apple MagSafe power adapter achieved the basic goal of a power adapter of connecting my computer to power, but once I saw how it would easily pull out when someone tripped over it, I wondered why it wasn’t a standard feature of power cords for computers to come out easily. It is the kind of feature that is only created when a power cord is tested in the many places people use them rather than in nice controlled conditions. The portability of a laptop created new challenges that were never an issue with desktop computers. The MagSafe made a MacBook portable even while plugged in. 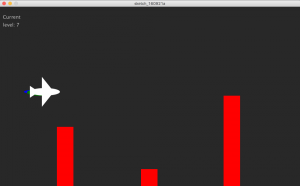 I used the force sensitive resistor as an input for a game in Processing where the player flies an airplane to dodge walls. The force on the FSR determines the height of the airplane, which travels past obstacles at a constant speed. Originally, I wanted to have a trail following the airplane to show where it had been, but to improve the feel of the game, it was reduced to very small flames behind airplane to give a sense of the movement. 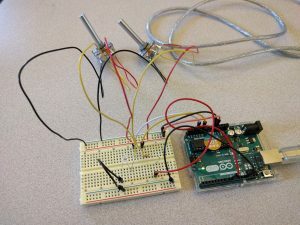 An LED on the Arduino correlates its brightness with the FSR force for debugging when the serial connection has trouble. I built a force diffuser from paper towels sandwiched between two stacks of sticky notes. The sticky note stacks were approximately the right size to be pushed with a hand, and the paper towels worked well because the amount of force diffused could be easy modulated by adding or removing paper towels. The sticky note stacks could be replaced with any hard object of the same size. While diffusing force is very useful for measuring forces outside of the FSR’s range, I found that when using the FSR as an input device for a game, it was best to have as little diffusing as possible to allow a single finger to have the most control. Events and meetings in calendar applications usually have reminder notifications that let users know they are happening soon, but a 10-minute in advance reminder for an event is often overly jarring. Sometimes, the reminders come too late and I would be late even if I left then. Other times, the reminder is too soon and just distracting. The first problem is somewhat solved by Google Now when it gives notifications about travel time to another location, but the second problem can be solved with ambient media. I enjoy having the Campanile play bells on the hour, keeping an ambient sense of the time, but ambient media could make that specific to my calendar. A slowly rising sound or vibration would be less distracting when I am focused on something else and only need a background reminder of the time. I wanted to see where Hiroshi Ishii’s pin-based shape display used for telepresence and other projects would fall on Fishkin’s taxonomy. Is it a full metaphor, where it is just an object to be interacted with, or is it only a verb metaphor when moving hands in one location moves them in another location? Is that distant? The effects are both local and far away. It seems to cross boundaries and be hard to define in the taxonomy. For most other tangible user interfaces, Fishkin’s taxonomy was a great way to consider a spectrum of different interfaces that are called TUI’s. I appreciated the discussion about the proper amount of metaphor, and it helped me to consider how metaphor is helpful for learning, but strong metaphor can limit how an interface will be used. With an interest in calm computing, I would like to see a similar taxonomy made that considers how much information is obtained without conscious effort. Many TUI’s seek to let the hands feel and guide an interface without the user explicitly thinking about how they feel, which is similar to the background attention given to calm computing.